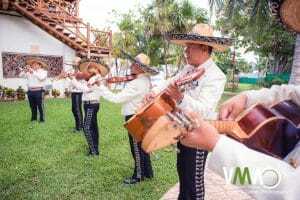 I just returned from Mexico, where I had the opportunity to perform Sydney’s Destination Bat Mitzvah Ceremony at Azul Fives, an all inclusive beach resort in beautiful Playa del Carmen, Mexico. My friend, Evan Gross, from DestinationMitzvah.com connected me with the family, and put an incredible team together to create a magical weekend of fun and sun, along with the beauty of family and friends celebrating this joyous occasion. If you’re looking for a unique way to celebrate this special event – read on! I’m excited to share why I LOVE this idea for all lifecycle events! 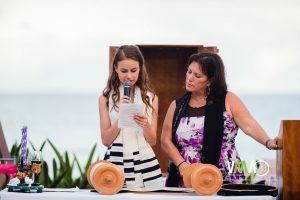 I think it’s amazing to celebrate a Bat Mitzvah this way – having several days together with your family to relax, celebrate together, and enjoy vacation time creates memories you would never have if you simply planned a 4 hour blowout party. When you have a 4 hour event, everything flies by in a flash! By the time you have your makeup done, photos done, and BAM! The ceremony and party are nothing but a whirlwind – and your memories are fuzzy and faded. But, when you have time to relax, enjoy, and truly celebrate, then your memories are truly ones you will keep forever. 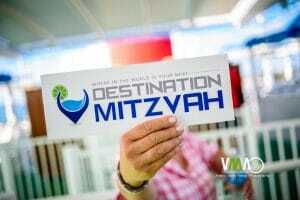 How you can have your Destination Bat Mitzvah ceremony anywhere you choose! 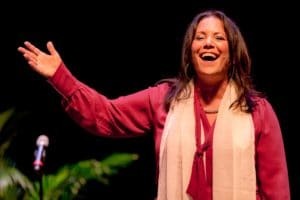 I’m a firm believer – that spirituality doesn’t come from the walls in a room – but from the holiness of the hearts of the people joining together. If we truly believe (and I do!) 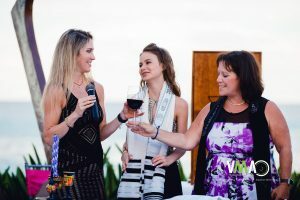 that God is EVERYWHERE – then God can certainly be present at your Destination Bat Mitzvah ceremony at the beach in Mexico! Our incredible teammate and highly talented Destination Bat Mitzvah photographer, Aaron Lurie, from VMA Event Studios took some incredible photos of our ceremony on Saturday evening. Welcome! 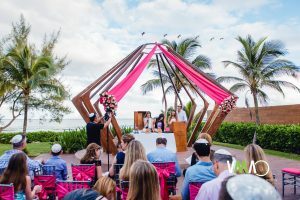 I’m so excited to share details of the newest trend in Bar Mitzvah and Bat Mitzvah – the Destination Bat Mitzvah in South Florida! It is becoming commonplace for Jewish families to take the B-Mitzvah experience into their own hands! Wow, has more than a month already gone by since we gathered as a community in the beautiful Miramar Cultural Center to celebrate the High Holidays 5778? I can’t believe it; but, it has. To be honest, September and October have flown by and, in my mind, are a combination of a blur of activity and a collection very specific moments which I can picture with level of clarity that makes them seem almost current. Looking Back… Irma, I Heard You! Let me be honest, the prelude to this year’s high holidays was not what I (or any of us) had expected. Hear that Irma?! The two weeks leading up to the holidays, during which I traditionally plan my services and coordinate the seemingly endless details associated with this undertaking, were interrupted by constant weather reports complete with a big storm icon emblazoned with the number five, right over my house! So, I bought water and canned goods, and batteries and fans. I hurricane proofed my house and I prepared for evacuation. And, I worked on my plans for the Hi-Ho’s 5778. Unfortunately, time does not stand still; and fortunately, life goes on. So did I. Sadly, something had to give; this year it was sleep. Everything else was too high a priority. Eventually, Irma came and went. Truthfully, she was frightening; but, in the end, she was “only” a category one. We saw the local damage she caused and we were all thankful we weren’t hit harder. Once I knew I was safe,I moved back home (after my brief evacuation to Delray). Then, with the help of my kids, I cleaned up all the hurricane debris around my house. And, during it all, I finished planning! 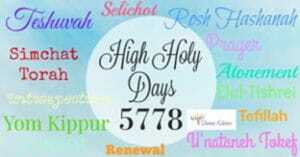 Before I knew it, Rosh Hashanah was upon us. The Miramar Cultural Center was beautiful, as always. Honestly, I have grown to love this venue. It truly feels like each year I am coming home. My community, my families, were actively present, and as always and I was beyond grateful to be there. Together with my father, Rabbi Steve, my daughter and son-in-law, Lauren and Jay, my son Trevor (who carries the Torah for the Hakafah!) and my most favorite congregant, my grandson Jayden, things couldn’t have been more perfect. The focus of my sermon was the number 7, which I shared has great significance in the Bible and in numerology. The knowledge that this was the seventh year we celebrated the high holidays in this location, together, brought me a special sense of peace. Remember, seven represents end of a cycle, it symbolizes completion and identifies an opportunity to review all that has occurred. I have spent considerable time reviewing. Now, I believe, it is time to move forward. As I look ahead, I find my heart and my head filled with excitement as I begin a new cycle. I remember this feeling from seven years ago, and I welcome it. Where will life take me? What new and exciting adventures lie ahead? Without question, I know that what I have built here, in South Florida, will serve as a formidable foundation for what comes next. It is strong, well-developed and ready to grow. The community I have brought together often seems like an extension of my own family. I treasure celebrating with you. Our time together is special, not only the high holidays as part of Shema Koleinu (http://shemakoleinu.org), but also all your life cycle events: your bar and bat mitzvahs, your weddings and your baby namings. I love working with your children and building relationships that enrich my life on a daily basis. So many of you have grown from my clients for a single event, to members of my community for all that we do together, to my friends for a lifetime. And, I cherish those relationships more than words can say. So, as I embark on my next cycle, so do all of you. It may not be the cycle that the number seven signifies. It may simply be the cycle of a new year. While the high holidays have passed, the traditional “holiday season” is almost upon us. First, Thanksgiving is upon us. Then we will celebrate Hanukkah and New Years. Start now to determine what is next for you personally and professionally. By beginning to plan your next cycle now, you are giving yourself time to reflect on the past, visualize the future. As a result, you will be able to develop a well-thought out plan to achieve your goals. Perhaps you can help me plan my next cycle. First, are you familiar with any areas with a large, unaffiliated Jewish population that may have a void that I can help fill? Any ideas of where can I expand the services that I offer? Please, let me know if you do. I am always looking to grow, to expand the communities which I serve and to evolve in everything that I do. All of this, of course, will happen while I continue to serve all of you, my community, my friends, my family. In short, a new cycle is the perfect time to look ahead. I just came across a well-written post by a Reform Rabbi in Washington, DC, in response to the recent NYT article that seems to be hitting a lot of nerves around the world. While I recognize that some of my colleagues provide this as a fast track, meaningless way to substantiate a monstrous party – not all of us do, and so here is my side of the story! Bar Mitzvah Training: It’s not just a job…. I just came across your comment and wanted to share another aspect of this situation that many seem to forget, or are not aware of. It saddens me, too, to see the rite of passage as nothing but an excuse to show off one’s financial stature. I’m not a nay-sayer either, but whole-heartedly believe that the community celebration should be one of meaning, with the closest of friends and family surrounding the child, and showing love and support. I am one of those Officiants, who provide unaffiliated lifecycles to my families, however, not for the purpose of fast tracking, eliminating, or for any other motive. 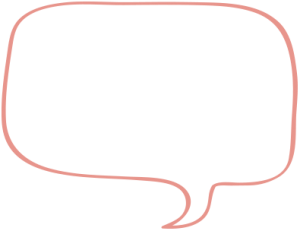 These are families who got lost in the synagogue shuffle, and felt that synagogues were busy expecting congregants to meet their own financial needs, rather than vice versa. In my town of Weston, FL, the Reform synagogue was bursting at its seams 5 years ago. With 700 families, they had one Rabbi with a lifetime contract since day 1, and a Cantorial soloist (not even a Cantor). B’Nai Mitzvah services were doubled, to two a day, on Saturday morning ONLY, with 2 students in each service. Many families wanted Havdalah services. Many families wanted smaller, private services to be held in the chapel, without the big pomp and circumstance and showiness of keeping up with those Jones’s. 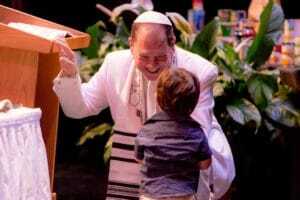 Many wanted their Rabbi (or officiant) to actually know their child’s name, but couldn’t commit to 3-5 days a week at the synagogue because of other commitments and demands on their childrens’ and families’ lives. 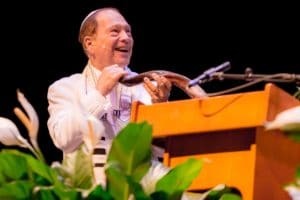 So – because the local synagogue couldn’t (or wouldn’t) meet those families’ needs – and because they truly wanted a meaningful, intimate connection to Judaism, and an opportunity to make their Judaism more personal and meaningful, and relevant, they found me. I am a deeply traditional, spiritual Jew, with a profound belief, and relationship with G-d. I actually teach my students how to pray – how to understand G-d, and make G-d meaningful and relevant. I actually engage my students in learning, and experiencing Judaism, by cooking in their homes at holidays, teaching them how to teach their parents (many who are in Interfaith marriages) and how to initiate a worship-style dialogue at their Friday night Shabbat dinner table. Please know that not all of us have offices that look like Wall Street. Mine is covered with photos of families I have worked with, pictures of places that my incredible job has taken me to, and is an environment that helps me remember that I am here to serve people, and not the other way around. Perhaps if synagogues began acting the same way- more families would walk in the doors, rather than out. 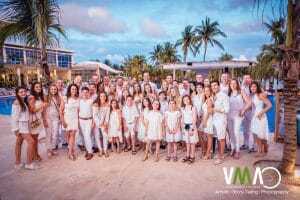 Rachel and Mara’s Havdalah Bat Mitzvah at the Hyatt Bonaventure Resort & Spa in Weston, Florida – Bat Mitzvah Times 2! After the amazing destination wedding in St. Pete, I rushed right back to South Florida, to get ready for Rachel and Mara’s Havdalah Bat Mitzvah at the Hyatt Bonaventure Resort & Spa in Weston, Florida. Rachel and Mara are sisters, almost two years apart, who prepared for their special day together, and it was a great experience, for them, and me. I always learn from my experiences, and this was no exception, but in the process, the girls became very special to me, as did Robin, their Mom. I think because the parents were divorced, and I could feel the dynamics of that divorce as it was something I went through myself, I identified even more. But, Jeff and Robin did a great job of creating a unified front, and making their daughters’ day the priority. 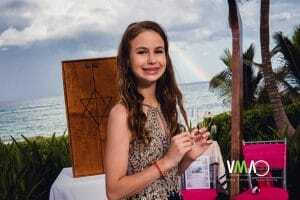 The Bat Mitzvah was held at the Hyatt Bonaventure in Weston on Saturday evening. The girls’ theme was New York City, and it was really beautiful. Learning their Torah portions were not easy for both girls, but I must say, they did the most incredible job. Especially Mara, who had the hardest time, so I just want her to know how PROUD of her I really was that night. The girls each did 3 Aliyot, the V’Ahavta, and I must say, they both wrote amazing D’var Torah portions. Their parsha, Lech Lecha, was about Abraham’s journey to a new land, and each girl related their experience of their journey into young adulthood, comparing it to Abraham’s journey into the new Land. Both girls were amazing writers, and will always look back and remember the special moments of listening to them express themselves through their own written words. 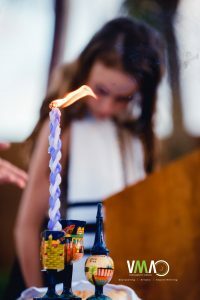 The opportunities to write personally really made this Bat Mitzvah experience more meaningful to both of them, which…isn’t that the purpose?? Yasher Koach, girls. I’m so proud of you both. Want to create your own Bat Mitzvah “dream come true”? 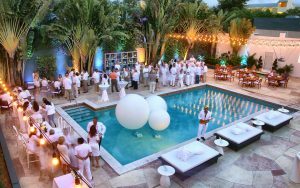 Contact Cantor Debbi today to see how you can co-create the event of your dreams.